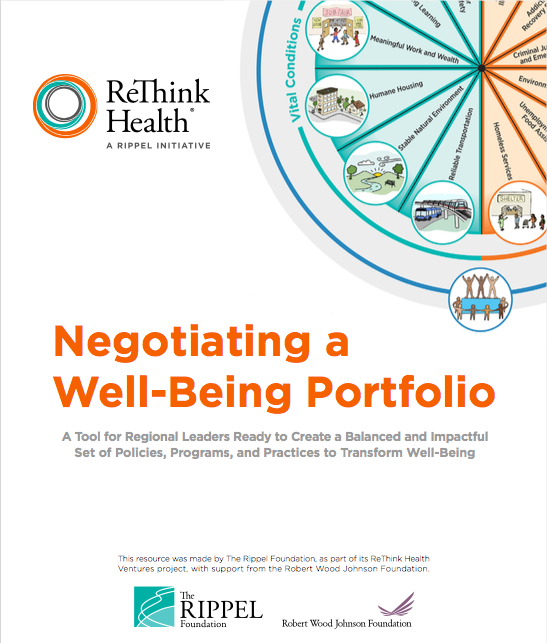 The Negotiating a Well-Being Portfolio exercise is designed to help regional leaders explore how to create a balanced and impactful set of policies, programs, and practices that will transform the system that produces health and well-being in your region. Leaders will consider 12 different portfolio options. Each represents a category of policies, programs, and practices that address either urgent needs or vital conditions. Investments in urgent needs enable anyone under adversity to access the services they may need temporarily to regain or restore health or well-being (such as acute care for illness/injury, food assistance, or income support). Investments in vital conditions enhance the properties of places and institutions that all people need all of the time to be healthy and well (such as a living wage, education, humane housing, and others). Leaders can also make investments on the outer ring, which represents efforts to strengthen belonging and civic muscle. Investments here assure specific attention is paid to development of the special capacities of people and institutions that convey to all a sense of belonging and power to influence the policies, practices, and programs that shape our world. A region’s transformation strategy represents those strategic areas its stewards believe they should focus on to pursue health transformation. Leaders working with their region’s “pie” will develop a visual representation of a well-being portfolio. This visual will help them understand the mix of vital conditions and urgent services that make up much of the investment (of time, money, and other resources) in their region today and explore how the mix should shift in the future to deliver better results.